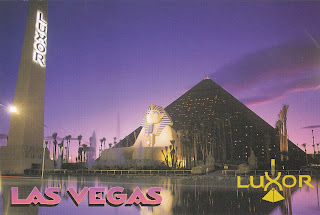 Postcard US-3971390 to Finland claims Luxor Las Vegas to be the next wonder of the world. The entrance to Luxor boasts a 10 story replica of the great Sphinx of Giza and an Egyptian obelisk over 190 feet high, and a water screen depicting Egyptian holographs. Named after the city of Luxor where the ancient city Thebes was located in Egypt, the hotel opened on October 15, 1993 with a replica of a pyramid-shaped tower that was the tallest building on the Las Vegas Strip at the time. After July 2007 innovation, much of the ancient Egyptian themes and artifacts inside the hotel were replaced with modern lounges, restaurants and clubs. The reflection pool seen on the card was removed to make way for a station of the Mandalay Bay Tram that was built between 1998 and 1999. Most recently, master magician Criss Angel opened "Mindfreak Live!" in Luxor on May 25, 2016, replacing his previous show "Believe" that ended its run on April 17, 2016 after 3,000 performances for more than four million audiences in seven years. Also, another significant change is that, as part of the MGM Resorts International's plan to charge for parking on their properties, parking will no longer be free after June 6, 2016.